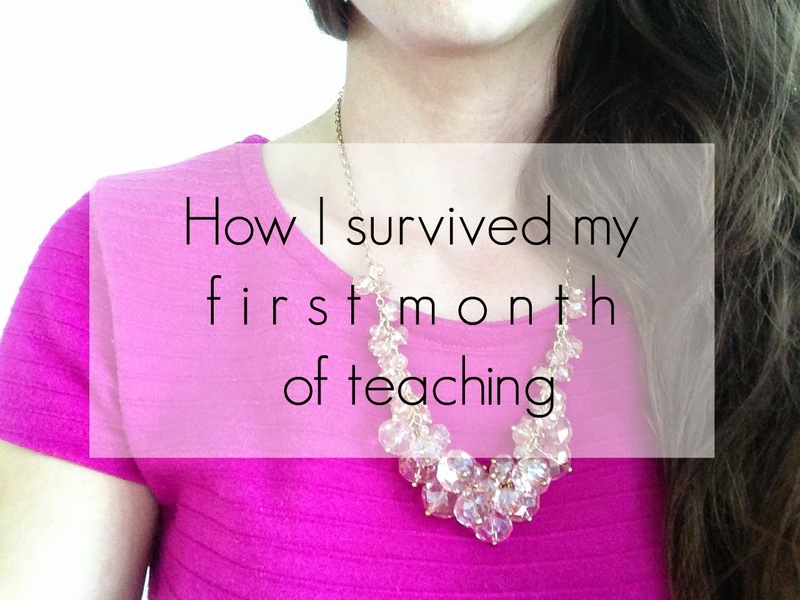 so here's my list of things that helped me survive my first month of teaching! and so much of it. my sister-in-law (the one who got married this past summer!) wrote me the most encouraging letter when i got hired, and in it she challenged me: "if you find yourself needing to be dependent on God every single day, you're doing it right! "so, every day on my walk from school to the train, i make a point to be specific in telling God just how much i need him. i spend that walk thanking him for what went well in my lessons that day, and i give him total credit, along with pleading for his guidance in each class the next day. on a typical day, i get one prep period (and every other week i get 3 prep periods...confusing, i know). this means that i need every minute of the school day to grade papers, make copies of handouts, and submit the next week's lesson plans (that i made from scratch, because it's my first year, remember?). i get to school suuuper early, and i apologize to kind, loquacious colleagues when i am furiously scrawling quiz scores into my gradebook because the period is about to end! my goal is for every class period to get students up and moving, tier the instruction (so kids at any level can understand! ), and have them writing and speaking spanish. this website is a really great conglomeration of interactive games for spanish class (that could be adapted for any class!). i talked to my old high school spanish teacher, other teachers i work with, and anybody tied to the field of education because i know i'm a newb and i know i need help! like when i took a broad survey of how to grade participation, and based on all the different systems people told me they used i synthesized them into my own. what's new with you? what's helped you survive being new at something? #5 always helps me. I'm not a teacher, but an Educational Assistant in the special needs program and this year I'm 1:1 with a boy who has Autism. I'm always asking the older EA's and the teacher, who was an EA, what the best approach would be, and to give me constructive feedback...all the time! I'm sure they're annoyed with me by now, but I'd rather know what I'm doing right/wrong, than to frustrate the poor kid, haha! Congrats on your first year! Yeah, I remember you mentioning your job in one of your back to school posts! And that attitude is so important, always looking for feedback and trying to be effective (which reminds me, I should go bother someone about observing me to critique me!) That kid is lucky have you! These are some great strategies. The first year is the hardest. I only have one prep most days, however, I find it is better not to use every spare minute working. I try to have one period a day, where I eat lunch and do not work (except for checking and returning e-mails). It helps me recharge. I also try not to commit myself to social plans on both weekend days. I try to leave one weekend day mostly open. I am at my best on a weekend morning, shortly after I wake up. I can grade more papers between 8:00 and 11:00 am on a weekend, than can in 5 prep periods combined. The 1 prep to chill period sounds like a better plan for the long run (which makes sense bc you're the seasoned pro!!). Thanks for being such a support in this whole teaching-endeavor!! I have a lot of teacher friends and I'm always so intrigued about how they plan their weeks. And just how to get through it, and it's always their students that make worth while! But cheers to your first month of teaching! They're all new just like you, a few of them just secured their teaching job this year!